We invite all persons in search of an enriching, heart-opening experience to join our dynamic Volunteer Program at the Centre for Living with Dying. 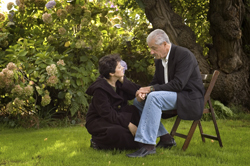 Support someone in grief by lending open ears and a compassionate presence. We welcome you to become one of the treasured "heartbeats" of the Centre for Living with Dying Program. What you gain from volunteering and opening your heart to others creates ripples throughout our community, our state, our country and our world. For more information on becoming a Centre for Living with Dying Volunteer, please contact Heather Rodrigues, Volunteer Program Manager, at (408) 850-6138 or hrodrigues@billwilsoncenter.org.